Sung is a member of the Flower Hmong and grew up in a small village outside from Sapa, close to China. When he was small he has never seen any western tourists and when he first met western tourists he felt very strange about the fact that he could not talk to them. So Sung started to learn English at secondary school. After secondary school he went to Hanoi to learn to cook and he became a chef. That is also where he first met his future wife Chan. After one year and graduating from the school he went together with Chan to Sapa, where he studied English by himself and talking to tourists every day. Only six month later he was fluent English speaking and passed a training for tourist guides. 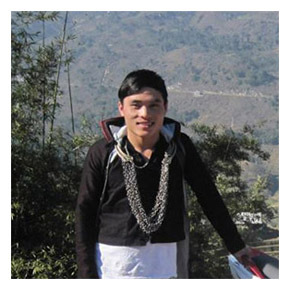 After working for almost one year at the reception in the Family Guest House in Sapa he was promoted and is now since August 2014 the manager at the Family Guest House. Sung is a very friendly person who is pleased to show you the beauty of this area and give you a look into the life of the ethnic groups living here. He will be happy to meeting you, become a good friend and make your time in Sapa unvorgettable.